Essential Qualifications & Experiences : (i) B.Sc. Nursing (4 year course) from an Indian Nursing Council recognized Institute/University. OR B.Sc. (Post-certificate) or equivalent such as B.Sc. 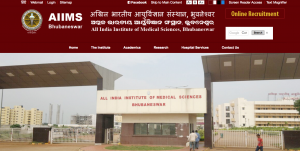 Nursing (Post Basic) from an Indian Nursing Council recognized Institute/University. (ii) Registered as Nurses & Midwife in State/ Indian Nursing Council. Experience : Three years of experience as Staff Nurse Grade-II after B.Sc. Nursing/B.Sc. (Post Certificate)/B.Sc. Nursing (Post Basic) in a minimum 200 bedded Hospital/Healthcare Institute. Essential Qualifications : (i) B.Sc. (Hons.) Nursing/B.Sc. Nursing from an Indian Nursing Council recognized Institute or University. OR B.Sc. (Post-certificate)/Post Basic B.Sc. Nursing from an Indian Nursing Council recognised Institute or University. (ii) Registered as Nurses & Midwife in State/Indian Nursing Council. OR (i) Diploma in General Nursing Midwifery from an Indian Nursing Council recognized Institute/Board or Council. (ii) Registered as Nurses & Midwife in State/Indian Nursing Council. (iii) Two years’ experience in minimum 50 bedded Hospital after acquiring the education qualification mentioned above. Application Process:-The aspiring applicants satisfying the eligibility criteria in all respect can submit their application only through ON-LINE mode. The On-line registration of application is made available on AIIMS, Bhubaneswar official website i.e., http://www.aiimbhubaneswar.edu.in. The link for submission of online applications in respect of above said posts alongwith other relevant information will be activated on the date of advertisement on Employment News/Rojgar Samachar or earlier (as posted on the website). The last date of online submission of applications will be 25th December, 2017. In case the last date falls on weekly off or holidays, then the last date of submission of application will be shifted to the next working days (upto 5.00 P.M.). No documents including online application form is required to be sent, however, all the applicants are advised to keep a copy of online application form with them alongwith proof of payment (a copy of challan/online payment receipt) for their record for future reference.